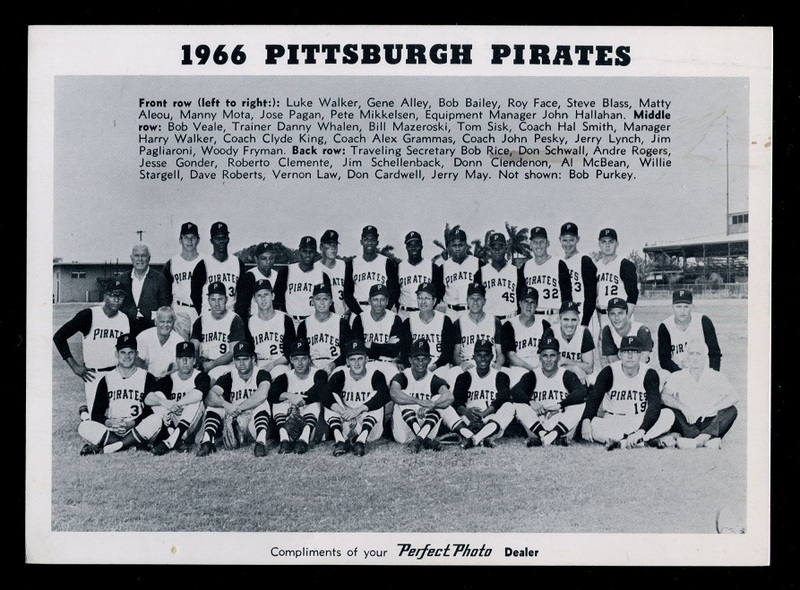 I did recently pick up a 1971 team photo pennant. I had no idea one existed so I was both happy and surprised by the opportunity to add one to my collection. It has condition issues but I am pleased nonetheless. It is the same format as the 1970 and 1973 versions of the same. I will post it when I have it in hand so it can be added to the list. I have a run of photo pennants from 1960-1971 including 2 different from 1960 and 2 different from 1968 as well as a 1965 All Star photo pennant with Clemente. 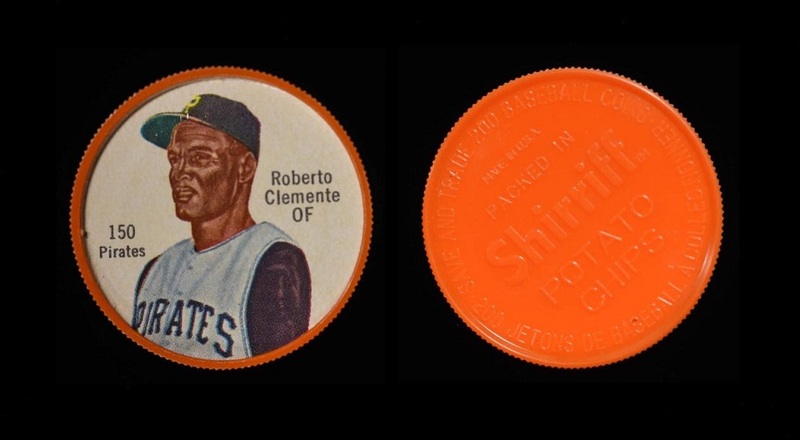 Don't recall that I've seen them from 1972 or 1973 (Is Clemente on the 1973?) Definitely a steal on that Tuscany statue! I don't own either of those two. 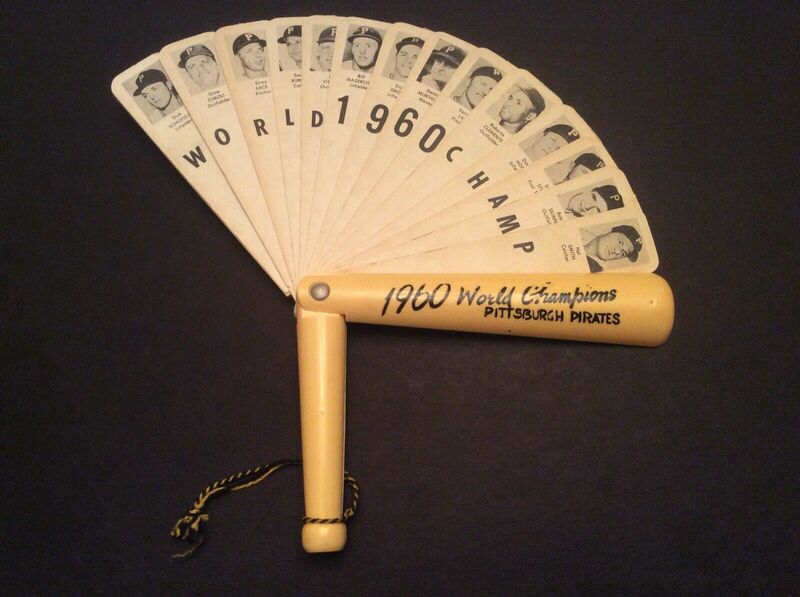 All of my Pirates pennants (9 different ) are from the 1971 season. 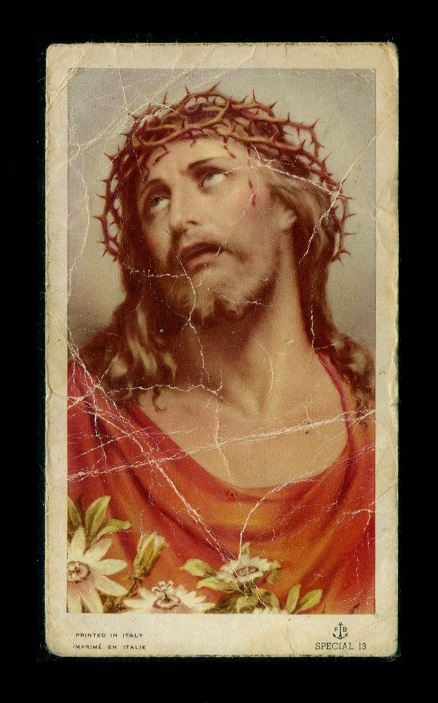 He doesn't appear on the 1973 version. I pulled it from a box of mementos in the basement; it's unopened. (I can't say I remember it at the time, but re-reading it now IMO the write-up comparing his life to a base-path is a bit corny). Similar to one Howard posted. Wish it had his photo and was in better condition, but sometimes you take what you can get. Not sure why there are so few of these out there, but they are rarely seen. Here is my fan. If you don't work something out with Howard, I might be interested in trading my unsigned one. Apparently these fans were meant to be signed. I saw this newspaper advertisement on another site. I thought I'd share it. 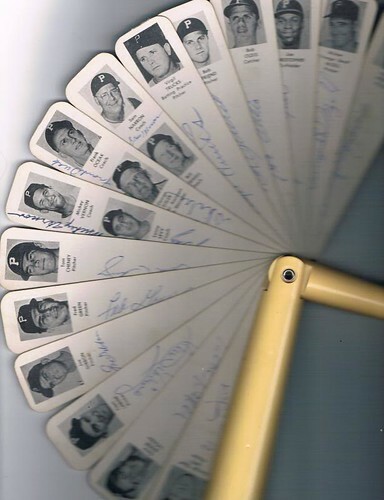 That fan is so cool to begin with...add the autographs and it’s just off the charts! 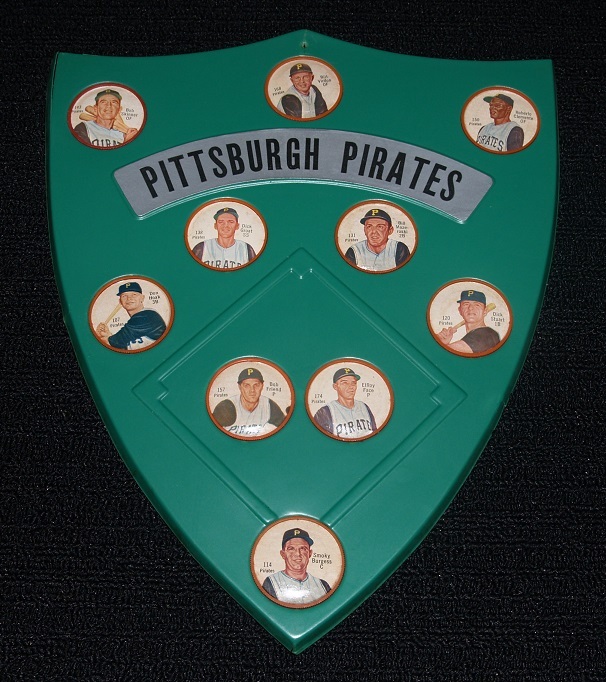 Yes, rats fan is one of the coolest pieces of memorabilia I’ve seen. 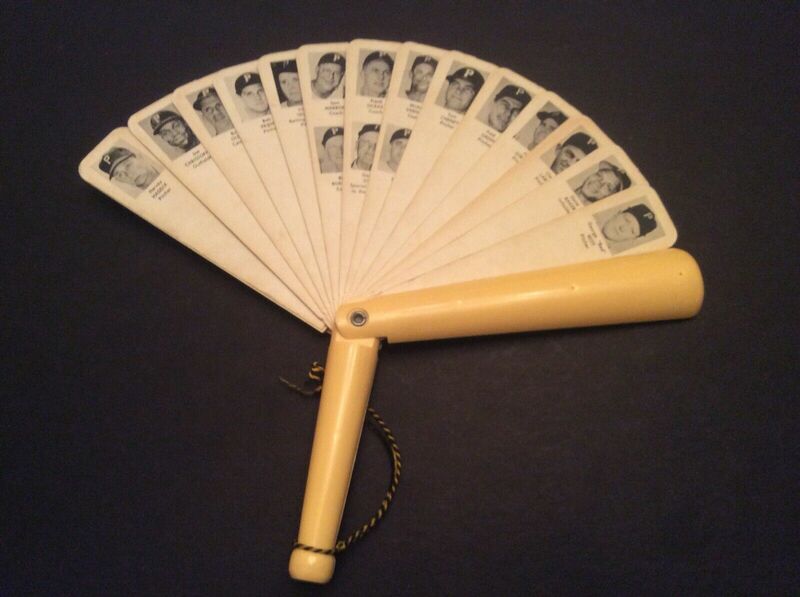 Wish I could pick up a bat fan for a buck fifty. 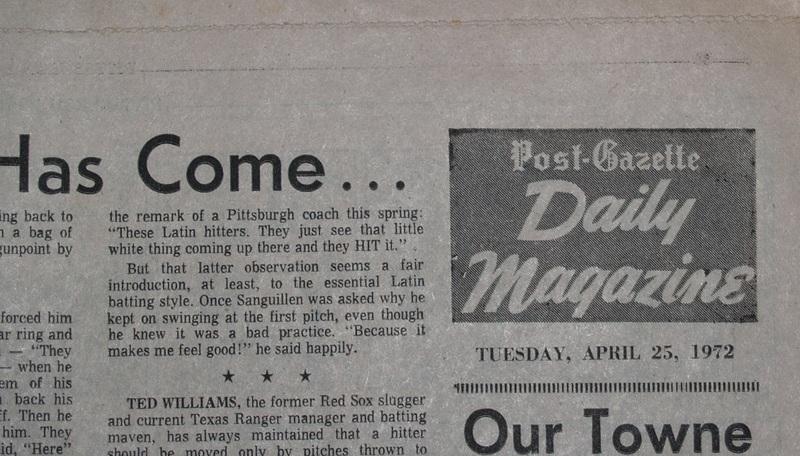 The article reasoning for the '60 WS outcome is fun too. I believe they both came from the gentleman who made the fans. A friend had him come to a show back in the 80s with 2 and he sold him one of them. I saw another at auction years later. Finally picked up a 1960 Bat Fan. Missing one blade ("S"), but has Roberto, so it will do for now. Seems much tougher to find than 15-20 years ago. Congrats! I see the bank is still out there..
You won't regret it they are both rare and awsome. Congrats on the bat fan! Very cool piece. I’ll try to update every now and then as I add items. 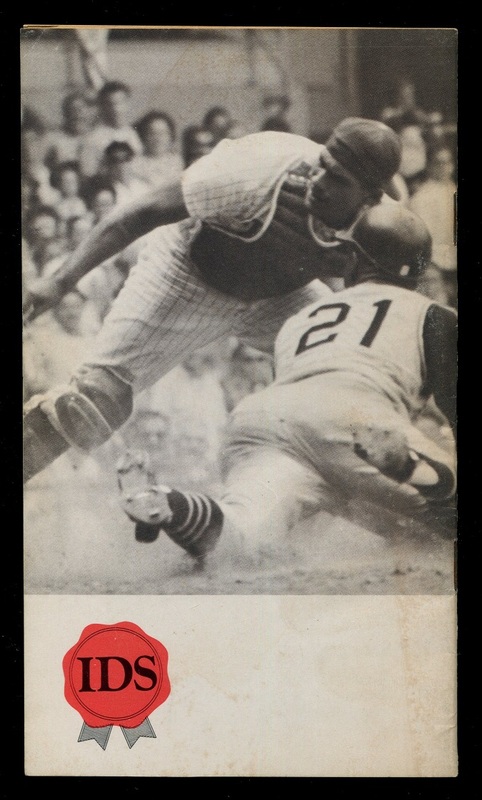 This is one of my favorite all-time threads, even though my collecting focus is pre-War cards. Thanks Val, you should do a WaJo thread, I can only imagine all the great items. I sold you his Mrs. Sherlock’s pin a little while ago. Mike, thanks for the kind words. I'm thrilled to have the WaJo pin. I think I've showed many/most of my WaJo cards in various threads over the years. Yesterday, I posted the 1962 Salada coin. I had wanted this next item for a long time but just never seemed to pick one up. I found one last year on eBay. 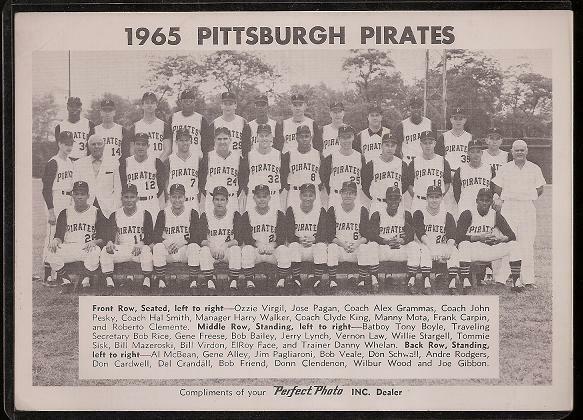 Have seen the 1965 Perfect Photo team pic before, but until I purchased these, I had never seen the 1964 or 1966 team photos. Not sure which one(s) I have or have seen - have to start digging to check. I do not think I have seen all 3. Nice photos! 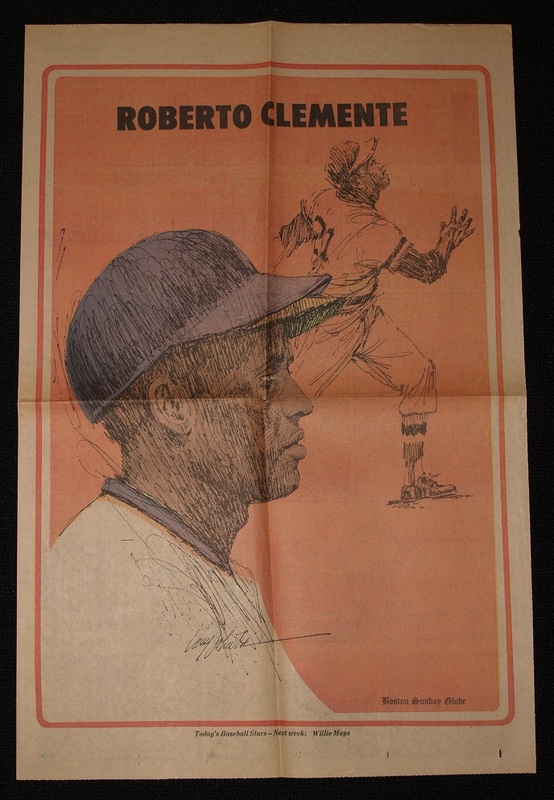 I just picked up an odd lot of Clemente stuff. 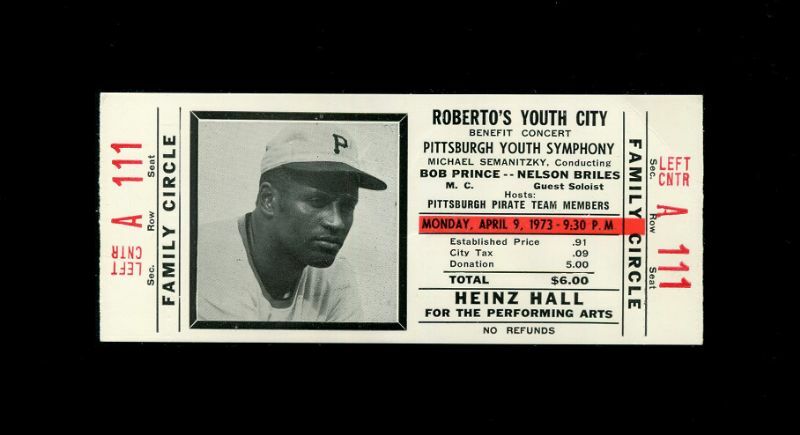 The only reason I took a chance on it was the A Conversation with Roberto Clemente album. I was intrigued by it because it is platinum and in a protective wood case. Have you seen one of these before? I saw that lot offered, but didn’t look closely enough to notice that album. Do you have it in hand yet? If not, let us know if there are any markings when you get it. Have not seen it before. It shipped today. I reached out to the seller and he confirmed it was a platinum album housed in a custom wood case that opens like a tri-fold. He said the case was original to the album. 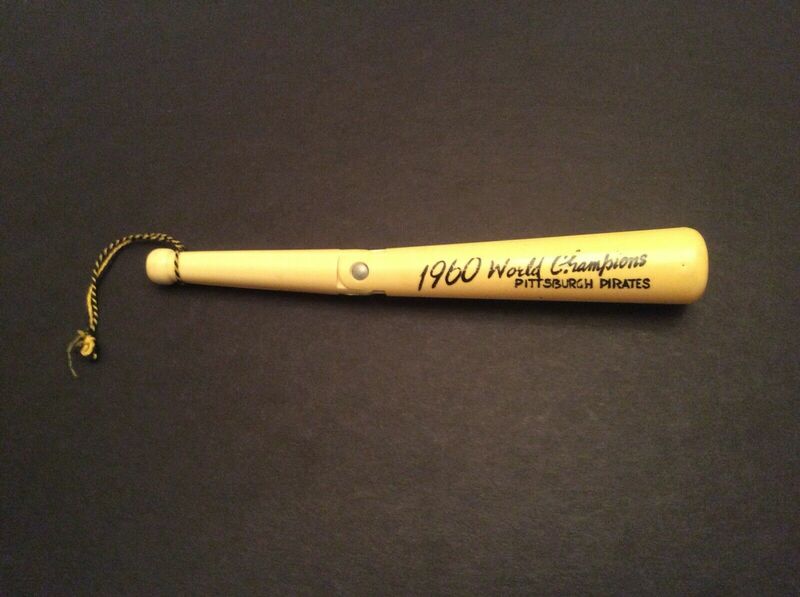 I saw one of these auctioned off from the Clemente estate recently but couldn't find the auction. I thought it was a Hunt auction. Nonetheless, I thought it was sufficiently unusual and cool looking to add it to my collection. I will post a better photo when I have it in hand. I won that lot from the Hunt auction! A little strange that a second one popped up - anyone know anything about how or why they would make something like this? We'll have to compare notes when you get yours. Was it on ebay or where? Last edited by hcv123; 03-26-2019 at 08:34 PM. It was on Ebay. I paid $90 deleivered for the lot. My understanding is that platinum albums are awarded for albums selling a million copies. However, I would be shocked if that record sold at that rate. But then again what do I know? 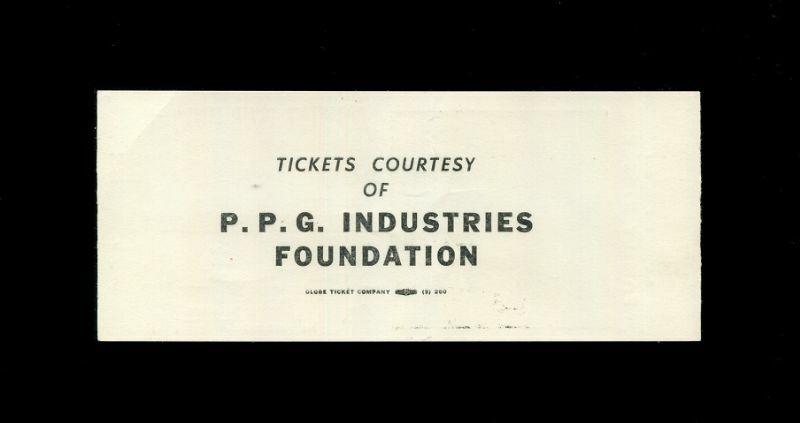 As noted earlier in the thread, there were 2 different tickets for different concert times. Picked up the second type. Nice pickup where did you come across it? It was on eBay a couple of months ago. I think I saw another one on there a couple of weeks ago, but not sure if it’s still listed. This is why I should never search closed listings. 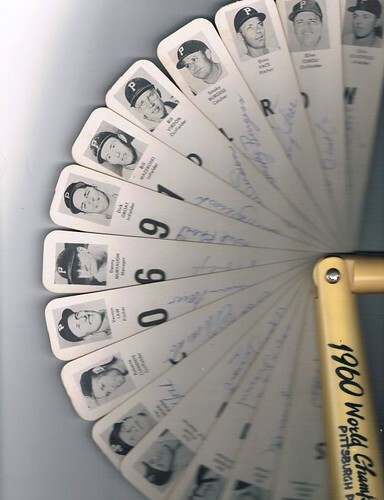 I believe this is an uncut sheet of a very rare early 1970s team issued set. I have seen the Robertson, Sands, and Gene Clines sell individually prior to this. 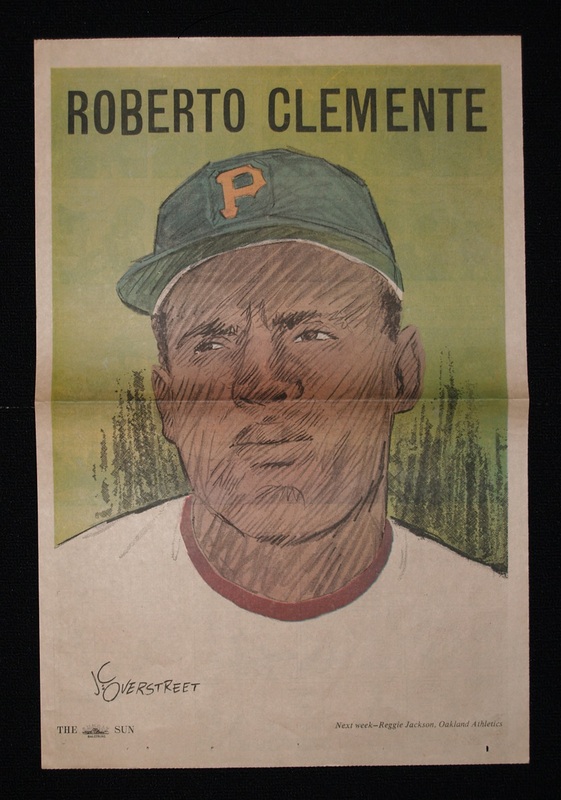 The sheet does have Clemente on it, albeit in rough condition, I thought I would share it here. Does anyone recognize this set? That’s a great sheet Mike. Did you miss out on the original auction and see it when searching completed auctions? 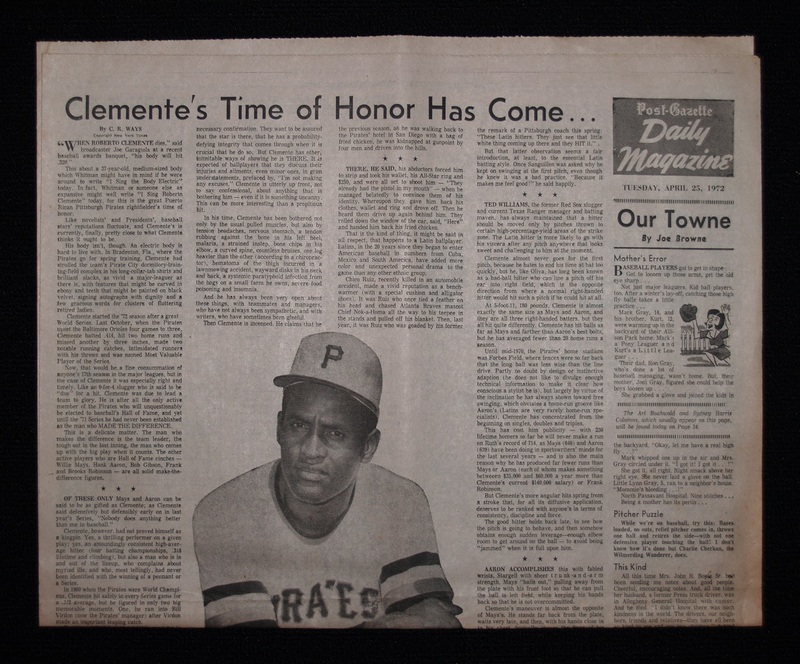 I thought I had the Clemente, but it appears I don’t. I have a different pose with name in white box that I got from Howard. I had it as a 1971 team issue. Last edited by docpatlv; 04-01-2019 at 03:26 PM. I have a few different issues in slightly different sizes and croppings of that image. Not sure if I have that exact one - will try to take a look. Awsome Clemente, I wonder what that set is called? 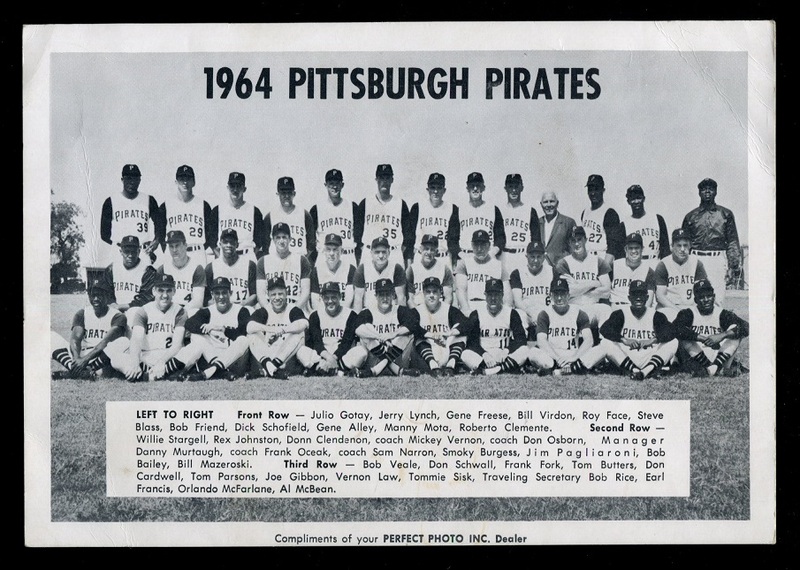 It is the same image as the 1971 Pittsburgh Pirates Action Photos. 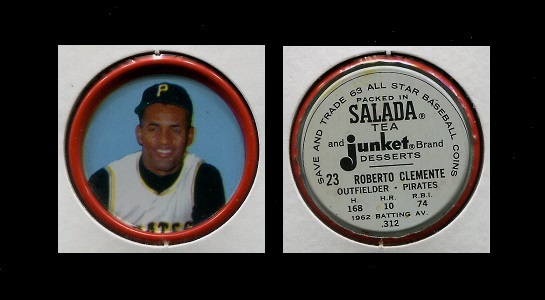 The Clemente pictured below (not mine) http://loveofthegameauctions.com/mob...entoryid=12660 the Stargell and Clines are from that set. The Bob Robertson is the same as the one on thesheet. They are apparently difficult to find. 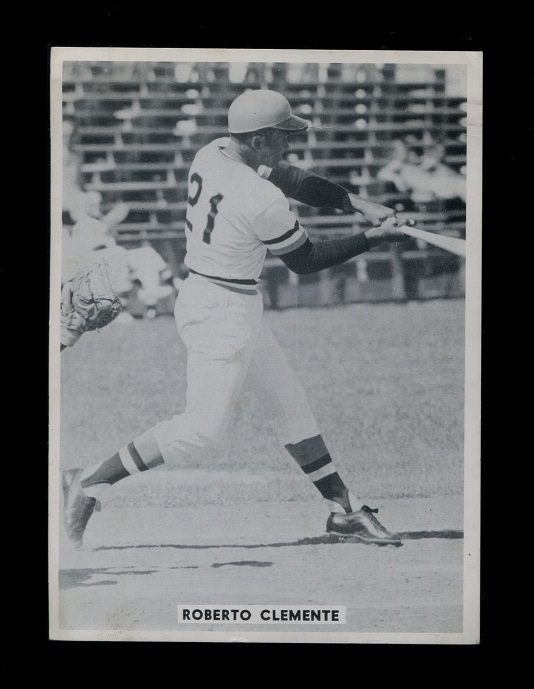 I do t believe PSA even has the Clines listed as a card in the 1971 Pittsburgh Pirates Action Photos set. Last edited by 71buc; 04-03-2019 at 08:32 AM. Last edited by 71buc; 04-04-2019 at 11:29 PM. Great pickup. I have to find the one I got in the hunt auction - as I recall yours is "fancier" - mine was just the platinum record in the standard sleeve. from a long time acquaintance and fellow board member! Thanks for the opportunity. 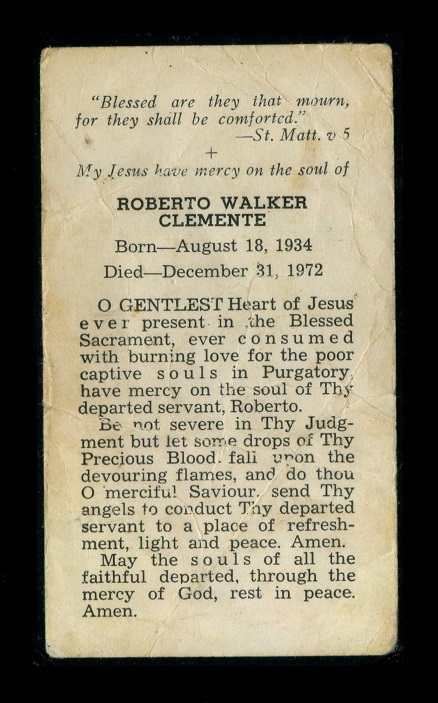 This is the only proof in the PSA database and in incredible condition despite the "A" qualifier. 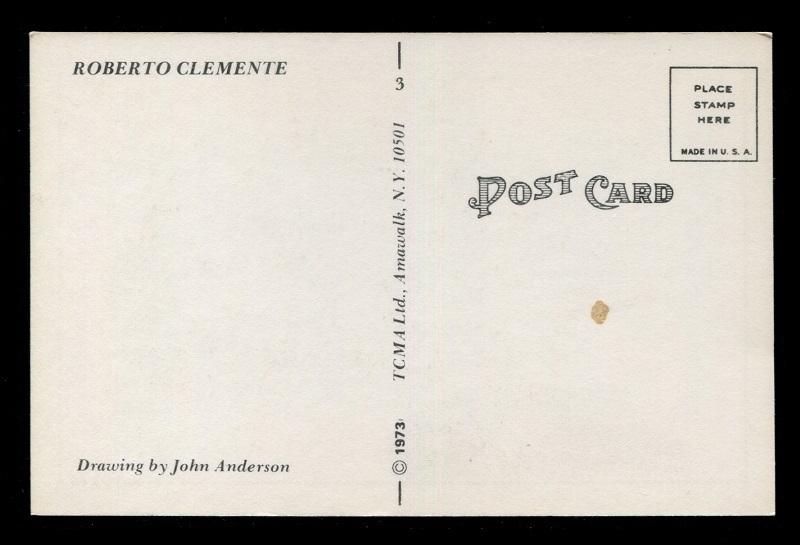 Surprisingly difficult postcard to find. 1971 Boston Globe Insert Page...tough issue to find. Many years after picking up the 1971 Boston Globe insert, I was finally able to acquire this next insert which is very similar. 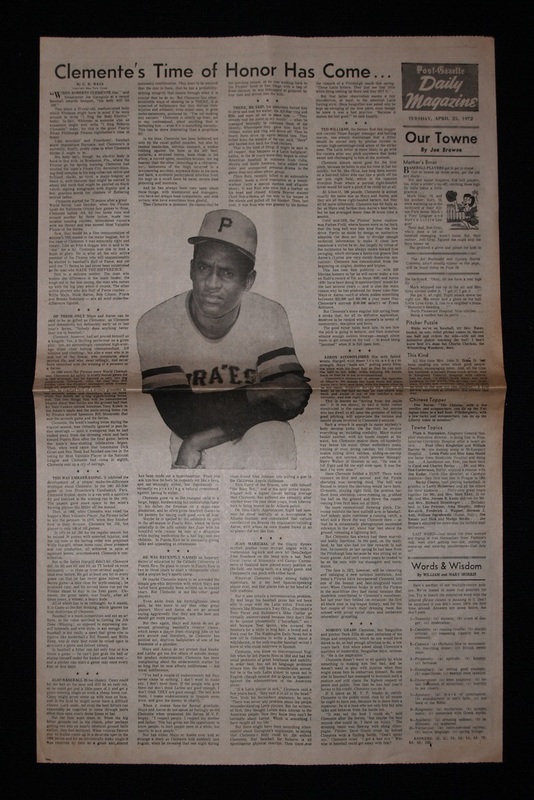 At the time I won the Boston Globe, the seller also had the Baltimore Sun, but I lost out on it. So glad to have finally added it. Nice pick-ups for my own selfish reasons I am pleased that you are keeping this thread alive. Thanks Mike! You need to post MORE of your items. 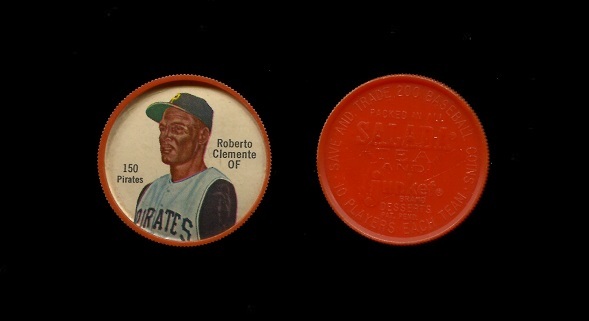 1st up is the HIGHLY elusive 1967 Venezuelan - 1 of the 2 highest graded and imho one of the toughest Clemente cards to find in any condition! 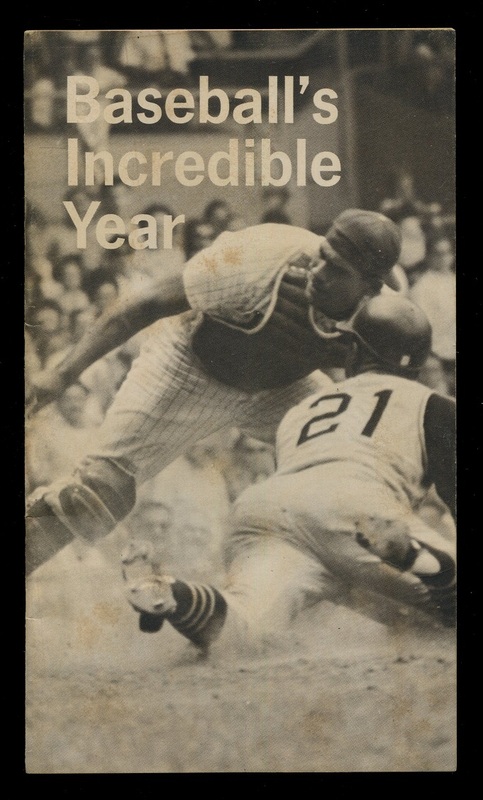 Next is the 1962 Dapper Dan dinner program honoring Clemente with an image of him on the cover - somewhere I also have a ticket stub from the dinner! Those are great Howard! I have never seen that Dapper Dan program before. I have seen the other cover (1972) a few times. Very NICE! The Venz looks great as well as really like the look of the program. By the way that ‘69 Super proof is very cool! He was actually on 3! 1962 was the first, 1967 and 1972. Anyone happen to have the 67 to post a picture or do I need t dig mine up? The 62 is far and away the toughest pf the 3 (imo) I think I've only seen 1 or 2 others. The 72 is next hardest and the 67 ironically the "easiest" albeit not easy. The 62 and 72 are smaller format - the 1967 full magazine size. Great story behind the 67 Venezuelan. It was once owned by John Rumierz. He introduced me to Venezuelan cards back in the mid-late 90's at the Willow Grove show. Oh to be back at his table again - just about you name it - he had it (don't bother looking him up, all the good stuff is LONG gone). The first time I saw them I thought they might be a scam!! John explained to me what they were and I (mostly) believed him. I bought a bunch of bigger name HOFers from him (mostly lesser expensive ones (heck his Ryan rookies were the most expensive at around 1k) - as I wanted to do some research and learn more before investing any real money). 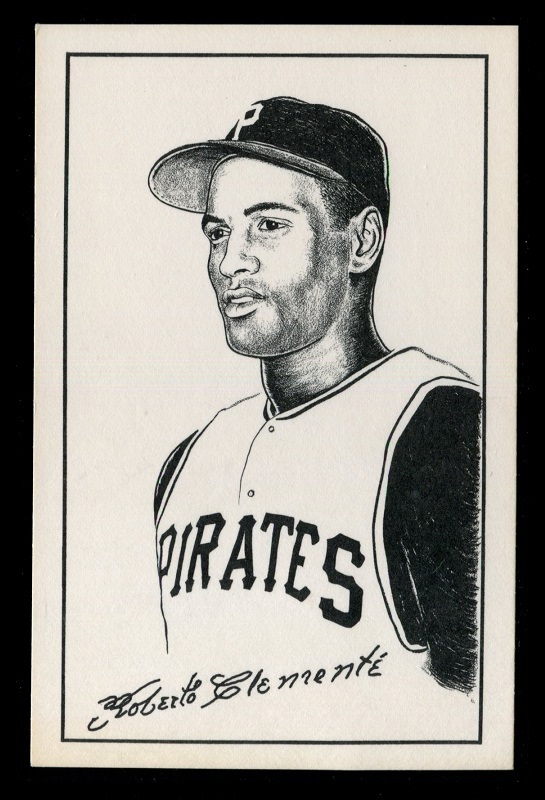 I bought a bunch of other Clemente cards from him that were in the 40-100 range. When I asked him the price on the 67 - he told me 1k (as much as the Ryan rookie!!) - When I asked him why, he explained that it was the only copy of that card he had ever seen!! I passed on it. I "visited" it 3 months and 6 months later at the same WIllow Grove show. In the mean time I could find very little information about the Venezuelans outside of verifying they were in fact legit. I think it was about a year after I first saw it, I called John who was kind enough to negotiate a little bit, and pulled the trigger. PSA has graded only 9 total copies of this card - 2 - 5's, 1-3, 1-2, 4-1's and 1 - Authentic. Rare both for it's incredible condition as well as in an absolute sense - over about 30 years looking, I have only seen this card publicly 2x - I just missed the graded 3 (Josh was a little quicker than me ;-)) and I owned (since sold) a raw copy that would have been a 1 or "A"
Last edited by hcv123; 04-18-2019 at 09:39 PM.